RainSaucer - How do I collect rain in a small space? How do I collect rain in a small space? Our products are currently categorized by their diameters- 48", 59" and 84". This give users a sense of how much space a system will take up in a yard or garden. However, this does not mean the overall footprint of a RainSaucers' system cannot be changed. The key is elevation and there are two possibilities which are particularly useful in small space situations. The first is elevation of the RainSaucer itself. This can only done with the 48" RainSaucer but the approach is simple. Instead of plugging the 48" unit directly into the 2" hole on the barrel, you make an extender (out of a 2" male adapter, 3' of 2" pipe, and a 2" female adapter) and install the RainSaucer into the extender. This reduces the footprint to just the barrel itself (see photo below). 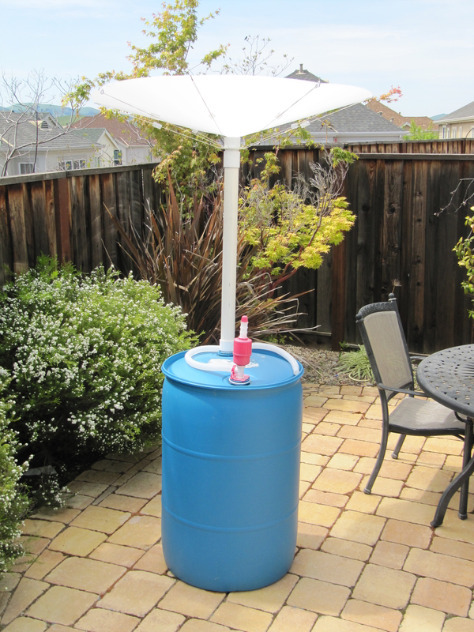 The second approach is to elevate the entire system on an extra tall rain barrel stand. This could be as basic as a stack of cinder blocks or as complicated as a custom-made wooden platform. Either way, the footprint will be the area of the stand only, not the RainSaucer (any size) on top.